Executive search firms have established themselves within the world of college basketball in recent years. These firms, which are tasked with helping find new head coaches, can have a lasting impact on the health of a Division-I basketball program. Over the past nine NCAA Division I men’s basketball off-seasons, 36.7 percent of head coaching vacancies have been assisted by search firms. Among those hires include: Ohio State’s Chris Holtmann, Oregon’s Dana Altman, Texas Tech’s Chris Beard, NC State’s Kevin Keatts, and Oklahoma’s Lon Kruger, among others. Programs in the “Power-Six” basketball conferences (Atlantic Coast Conference, Big XII Conference, Big East Conference, Big Ten Conference, Pac-12 Conference, and Southeastern Conference) are nearly twice as likely to use search firms during head coaching hires than non-Power-Six programs. The graph below shows the difference in search firm usage between Power-Six and non-Power-Six programs since 2010. Since 2010, 59 percent of Power-Six programs have used search firms while 31.6 percent of non-Power-Six programs have used search firms. In large part, we can assume the difference is mostly due to budgeting conflicts, as larger universities tend to have more financial flexibility than the smaller universities. The search firms researched charge between $20,000 to as much as $150,000 for a men’s basketball search, although the median price usually falls in the mid-five figure range. The fundamental question we set out to answer when conducting this research was whether hiring a search firm results in a significant payoff to the university. Using our Power-Six vs. non-Power-Six model once more, we have found that head coaching tenures tend to be slightly more successful when the head coaching vacancy was assisted by a search firm. Power-Six programs that have hired search firms since 2010 have recorded an average head coaching tenure winning percentage of .525 while Power-Six programs that chose not to hire search firms have recorded an average tenure winning percentage of .519. Moving over to the non-Power-Six side, the difference in average head coaching tenure winning percentage between firm and non-firm hires is .495 compared to .462. Overall, search firm hires have translated to an average head coaching tenure winning percentage of .504 compared to .469 without search firms. Through our research we have found that firm and non-firm hires have had varying measures of success based on the hired head coaches’ previous positions. The table below indicates the average tenure winning percentage based on whether the head coach was hired through a firm or without one, and also the most recent coaching position of the hired head coach. Programs that have hired search firms have enjoyed a slight advantage when hiring former head coaches. Previous Power-Six head coaches have recorded an average tenure winning percentage 2.4 percentage points higher (.519 to .495) than non-firm hires. When hiring non-Power-Six head coaches, the winning percentage difference rises to 3.0 percentage points (.529 to .499). As for hiring assistant coaches, there is a 2.9 percentage point difference when hiring Power-Six assistants (.500 with firm assistance and .471 without firm assistance) and a 1.3 percentage point difference when hiring non-Power-Six assistants (.449 to .436). When promoting head coaches from within, the average tenure winning percentage between firm and non-firm hires is equal at .485. This is the only situation in which hiring a search firm is not at least 1.3 winning percentage points better than not hiring a search firm. The table below shows the frequency of head coaching hires based on previous coaching position and whether the coach was hired through a search firm. As seen on the chart, firms are more likely to hire Power-Six head coaches and Power-Six assistant coaches as well as non-Power-Six head coaches. From then on, it is more likely that programs without firms hire non-Power Six assistant coaches, non-Division-I head coaches, or promote from within. Though programs develop relationships with search firms, it should be noted that only 19.6 percent of the time a program hires the same search firm in consecutive head coaching hires. In recent years, this has included Oklahoma State, Tennessee, and Texas Tech among high-major programs. The flowchart below displays how programs have progressed through multiple coaching changes, based on search firm involvement, over the previous nine off-seasons. Almost 70 percent of the time a program choose not to retain a search firm after going without a firm during its previous head coaching search. 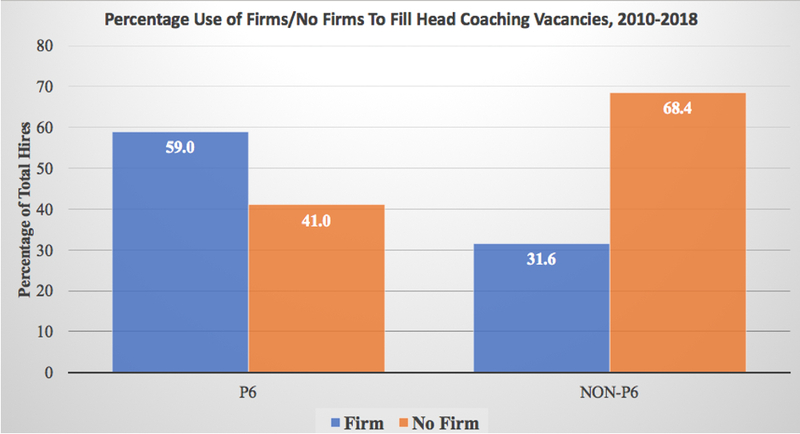 As for programs which used search firms during its most recent vacancy, 41.3 percent used a different search firm and 39.1 percent of programs chose to abandon search firms altogether in its following head coaching search. Texas Tech is one of the more peculiar examples in recent years in the discussions of search firms in college basketball. In 2011 and 2012, Texas Tech did not hire a search firm when it welcomed Billy Gillespie and Chris Walker, respectively, to the university. Gillespie and Walker logged a combined 19-43 win-loss record over two seasons. The university then brought on Fogler Consulting in 2013 to help land Tubby Smith, who later guided the Red Raiders to its first NCAA Tournament appearance in nearly a decade. After Smith left for Memphis, Texas Tech again retained Fogler Consulting for its the vacancy. Fogler linked Chris Beard, a well-traveled, longtime junior college coach, to take over the reigns of a Big XII program. In just two seasons, Beard guided Texas Tech to a No. 3 seed and led the team to the Elite Eight of the 2018 NCAA Tournament. To conclude, our studies have indicated that there is tangible evidence that search firms have translated to success in D-I men’s basketball. Understanding the trends, successes, and failures of selecting or not selecting search firms can allow programs to gain an upper edge on their competition.